Thanks to Darryl Fuller of the Canberra show's committee for the miniature sheet. 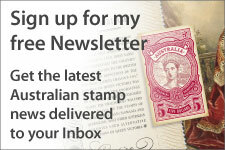 I believe I am the first website to feature the show miniature sheet, and selling arrangements for the Macquarie imperforate prestige booklet. If you have an interest in Canada or Sweden, then you know that the two countries will participate in a joint issue featuring sea life to be issued on 13 May. 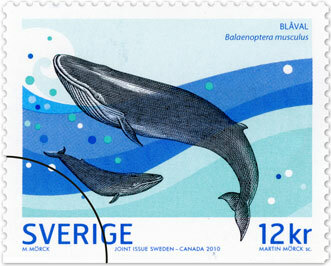 Sweden Post has posted an image of one of the stamps (shown here, click on the image to enlarge the stamp), showing a blue whale. Sweden will release the four engraved 12kr stamps in a booklet. It is not known if the Canadian stamps will also be engraved - we'll only find out in March when Canada Post releases the next Details. 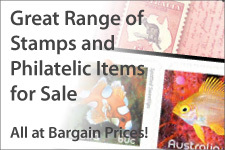 Visitors to Australia Post's online Stamp Shop late on 5 February would've noticed a new category 'Test Direct' and new item on sale 'Online Test Product'. 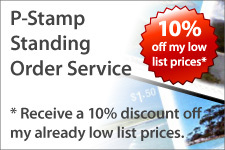 Clearly this test item has appeared on the website by mistake (perhaps indicating a new category will appear soon), however it was possible to order it (for $5.63). We await to see how Australia Post handles orders for this product.